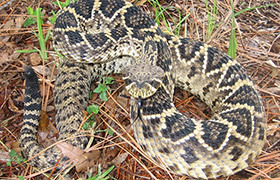 Venomous Snakes of Florida: Florida is a state that provides the perfect home for snakes - plenty of marshes, salt groves and close-to-water areas providing food sources such as lizards, newts, salamanders, frogs, tadpoles, small fish and even insects, moving into more suburban areas such as busy cities and towns, offering mice, rats and other small mammals and rodents. Out of the 50 or so snake species commonly found in Florida, there are only four of them known to be venomous which is good news for those visiting or living there. 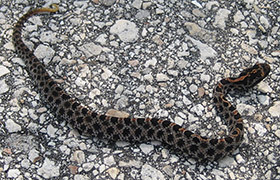 For photographs of the common species of snakes in Florida, click on the Common Snakes of Florida page. Florida Cottonmouth: Also known as the water moccasin, the Florida cottonmouth is another of the venomous snakes of Florida mimicked by other species of non-venomous snakes. Given it’s name because of the white interior of its mouth, it’s a semi water-dwelling snake often dark in color and pattern, getting darker as they age, growing to around four or five feet in length. This snake lives across Florida, preferring watery, marsh areas but often venturing into populated towns for the promise of rodents and small mammals. Although thought of to be a very aggressive snake, it will only attack when threatened and more deaths occur when humans try to kill a venomous snake than when they leave them alone. The venom of this snake is very dangerous and the toxins cause the blood to fail at clotting, bringing hemorrhages which are fatal if left untreated. The snake is more dangerous because it looks very similar to a brown water snake, a non-venomous and very common snake of Florida. Eastern Diamondback Rattlesnake: One of the biggest of all venomous snakes of Florida, the eastern diamondback rattlesnake can grow to over six feet long, a snake you’ll want to back away from rather than stand and fight. A pit viper that loves to live in vegetation or thick brush, this snake often strikes when humans are unaware, the ambush predator often being surprised along fallen trees, under logs and rocky hills. Despite being the biggest and most intimidate of all venomous snakes of Florida, the diamondback rattlesnake is actually a pretty docile beast, choosing to slither away or, in the worst case scenario, using the loud rattle at the end of its tale to warn opponents away. 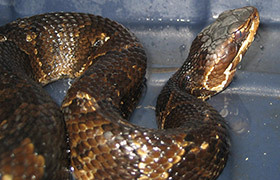 The venom of this snake contains the same anti-clotting toxins that the Florida cottonmouth does, except the diamondback rattlesnake also boasts the longest fangs of all rattlesnakes, and for meat and habitation decline, the snake is often killed and in some cases, this is done during ‘roundup’ meets, massively declining the population of the snake. Dusky Pygmy Rattlesnake: Some people in Florida call this the "Ground Rattler". Only growing to a maximum of about 22 inches long, the dusky pygmy rattlesnake is rather underwhelming in size with a rattle so small when compared to other species, it almost sounds like the buzz of an insect rather than the warning call of a venomous and highly toxic reptile. Although the bite is not a fatal one, it does prove very painful and will require medical treatment. It’s a very common snake and one that has no problems coming into contact with humans, making it responsible for the majority of all snake bites across the state, especially in curious children. Youngsters will often confuse the small size of this snake to mean not-dangerous but this is not the case. 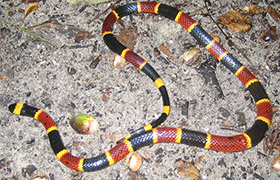 Coral Snake: The good news about this snake is that the coloration is the biggest warning sign you need - bright red and yellow stripes that scream Stay Away! There are a number of venomous coral snakes inhabiting the USA but the Eastern Coral and Western Coral are the two you will most need to concern yourself with, slender snakes that only grow up to about 30 inches in length. The non-venomous Florida Scarlet snake is one often confused with the venomous coral snake but although the coloration is similar, there are a number of features which help to tell the two apart. For more information, go to my Snake Removal - How to Get Rid of Snakes home page, and learn more about how to get rid of the poisonous snakes of Florida.